Something got me a bit excited today while I was making purchases at my fav op shop. Well, yes I am usually pretty excited about making op shop purchases, but there was something else. 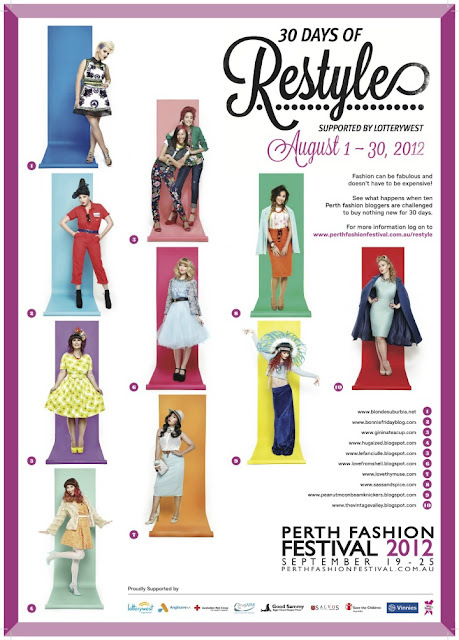 It was this, an event organised as part of the Perth Fashion Festival, in which ten Perth bloggers wear an outfit which is at least 50% op shopped every day in August. They then blog about it of course and pictures are posted on the Restyle website. ...ten Perth bloggers. TEN!! I didn't even know there were ten Perth bloggers. As soon as I got home, I looked them up. ...green with envy, I wondered how they were chosen to be part of this. ...op shop outfits! I LOVE the op shop. My wardrobe is full of bargain treasures. ...so, by 'op shopped' do they mean straight from the op shop 'as is', or can you have refashions? I love refashions. Then I looked down at my outfit for today. It is at least 50% op shopped, as usual. Suddenly I had an idea. Maybe I wasn't chosen to be part of this officially, but that doesn't have to stop me joining in anyway. So, I've set myself a challenge: to wear outfits that are at least 50% op shopped (including refashions...ok and self-made items from op-shop fabrics) every day for the month of August. Wasting no time, I nipped out between downpours and snapped some pictures of my Day 1 outfit. Cardigan - Zaket and Plover, bought last month at Dunsborough church op shop $4. Top - Witchery, bought a couple of years ago from an op shop (forgotten which, approx. $4). I hope I can keep this up as I have done no preparation whatsoever. We'll see. Would anyone care to join me? PS. As for my op shop purchases for today, you'll just have to stay tuned this month to see! Thank you for taking the time to comment. I value every single one. Boylston bra - one, two, three and success! All the images used on this blog belong to meggipeg unless stated otherwise. I request that any of my images are referenced back to me if they are used elsewhere and I will do the same for images i use from other people.